My sister Renatta started dropping hints that she was craving pumpkin donuts. And by hints I mean the following: “I’m really craving pumpkin donuts with a cinnamon sugar coating. 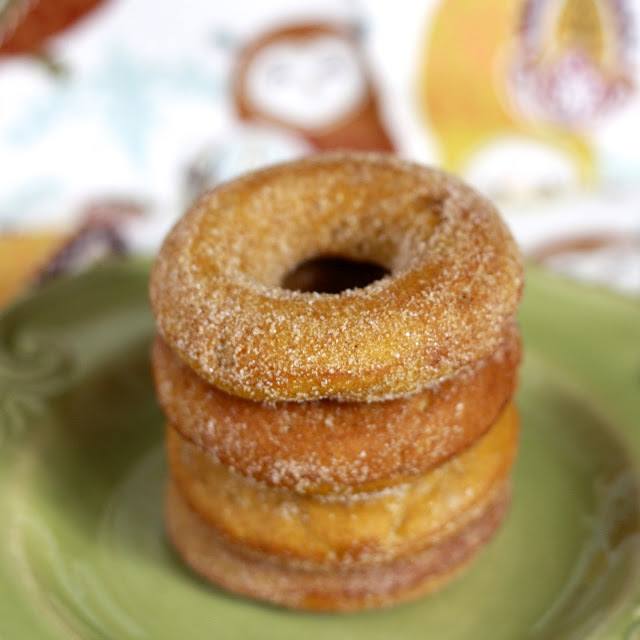 Can you make them for me?” My donut pan spends way too much time in the cabinet so I happily obliged, right down to the cinnamon sugar coating. If you don’t have a donut pan, fear not, King Arthur recipe testers attested that the batter can also be cooked in a muffin pan. The donuts pictured in this post were to Renatta’s specifications—cinnamon sugar dusted—but I also added mini chocolate chips to some of the batter and didn’t coat them in anything. Both were winners and Renatta’s craving was fulfilled. I preferred these warm from the oven but she didn’t mind the leftovers, reheating them in the microwave for ten or fifteen seconds. 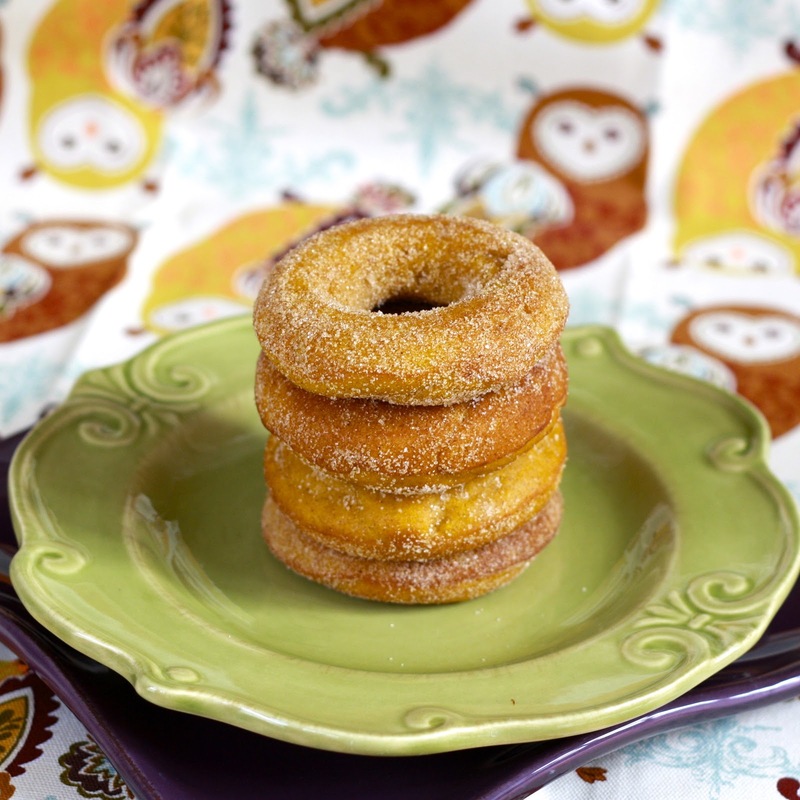 Don’t be shocked if your cinnamon sugar donuts change in appearance—the coating dissolves into the donut after the first several hours....they'll still taste the same though! 1. Preheat oven to 350F. Grease a donut pan or a muffin tin with cooking spray. In a large bowl, beat together oil, eggs, sugar, pumpkin puree, pumpkin pie spice, salt, and baking powder. Add flour and stir just until smooth. If using mini chocolate chips, stir in now. 2. Transfer mixture to a gallon-sized Ziploc bag and cut off the corner of one edge. Pipe batter into prepared donut pan (no need to pipe if using a muffin tin), filling each cup about 3/4 full. Bake for 15-18 minutes, until an inserted toothpick comes out clean (muffins will need 23-25 minutes). 3. Remove pan from oven and allow them to cool for 5 minutes. Remove donuts from pan and toss with cinnamon sugar mixture (Place cinnamon and sugar, quantities to taste, in a large Ziploc bag. Add donuts, close bag, and shake.). Place on a wire rack to cool completely.